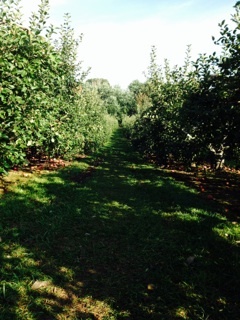 This weekend we ventured out to pick us some apples. Of course we could have just as easily stopped by a local grocery store and grabbed us a bag. Buuuuut I’m all about the experience. Myers apple farm is a short 15 minute drive and on an early Sunday morning, it was a was very nice drive. I didn’t want to rush right in and pick. First stop, the store. What is not to love about the little stores that the farmers have on location! So many fresh delicious “wears”. A liter of fresh made apple cider, small pie pumpkin and……..we scooped the most incredible apple pie for later in the day. Still not ready to pick. As a child I spent some time growing up on a farm. In addition to the waking to roosters I fondly recall the freshly drawn goats milk for breakfast. It was warmed, naturally, and had just a bit of foam floating on the top. We wander over to where they had some chickens, roosters, a big pot belly pig (swear off bacon usually at this point), rabbit (mmmm, yes I like rabbit……baked) and the goats. 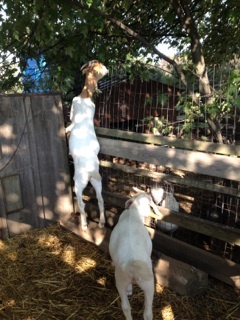 Watching them, well, being goats is such a mindless pleasure. By now the kids were lost in the simple pleasures of a farm and all it’s habitats that the urgency to pick n go had past. No one was ready to pick yet. They spotted the horses. What was nice about Myers farm was that the animals although gated in, had a lot of space to roam and be themselves. The horses were no different. 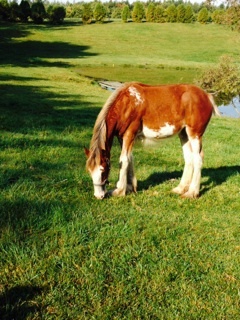 We took the long walk down the lane to where 4 horses were grazing, 2 of them baby clydesdale. The walk took me into a surreal place. It was a place of déjà vu yet a place of a peek into the future. In listening to a talk from Deepka Chopra recently, this state of awareness, a state where you experience your world with and as thoughts, sensations, feelings, moods, images in consciousness is enlightenment. It’s calming, yet exciting. After spending a good deal of time admiring the horses and property…….ready to pick. In addition to sharing two apple recipes I also want to encourage you to build some memories of leisurely time with not only your family but with nature. Take the time to pick and on your way out remember to thank the farmer……….farmers feed cities. The first is an APPLE & CELERY SALAD which I got very excited about. Not only the crunchy texture or the combinations, which I never would have thought of, or the fact that I loaded it with walnuts making it a post RESET perfect snack, but also because you can see the power of antioxidants. Have you ever cut an apple and left it to sit???? Ewwww, ya, it goes brown. What you see is oxidation happening. So, what do you do to slow down the browning???? Yep, introduce an antioxidant. This picture is of the salad 2 days old! Wow, talk about pristine. The powerful antioxidant applied was a good old lemon. *two apples, washed and sliced into matchsticks (skins on). 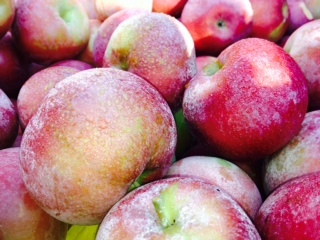 You can use any type of apple, generally look for tangy firm and fleshed varieties. I used Macintosh. *one cup of celery (2 or 3 stalks) sliced into matchsticks. Combine apple and celery together in a serving bowl. 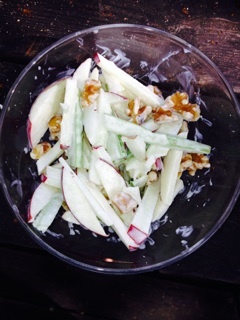 Toss the apples and celery in this dressing with a generous grind of fresh black pepper and 1/2 cup chopped walnuts. *carrots would be a good add in!!!! Ooops, almost forgot the second recipe/idea! I have one gripe with juicing and shakes/smoothies. It’s at least 75% if not all carb! The protein needs to be higher to sustain your energy, curb your hunger pangs. Whether we’re juicing or making a shake/smoothie, we’re ALWAYS adding some protein powder. So, here we have the transition from summer smoothies/shakes to fall flavors. That same pumpkin we purchased was steamed and added to morning smoothies …….give a Pumpkin Pie Smoothie a try!!!! All together in your blender/bullet. Blend until smooth. ENJOY with an extra dash of cinnamon on top.